Uefa chief Michel Platini produced no documentary evidence for the 2m Swiss francs (£1.35m) payment made to him by Fifa, the BBC has learned. Fifa's ethics committee is looking into the "disloyal payment", made nine years after Platini carried out consultation work for Fifa president Sepp Blatter. 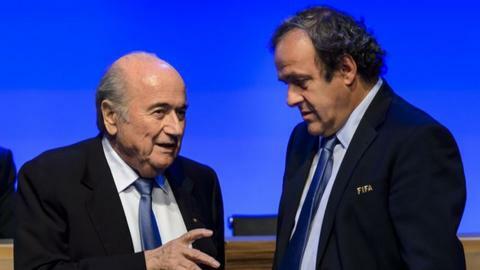 Platini, a Fifa vice-president, and Blatter are serving 90-day bans while corruption claims are investigated. In September, criminal proceedings against Blatter began in Switzerland. BBC Radio 5 live sports news correspondent Richard Conway says a written contract did exist for Platini's work for Fifa between 1998 and 2002, according to sources. A total of SFr 1.05m (£710,000) is believed to have been paid to the Frenchman. It is an additional SFr 2m (£1.35m) that was paid in February 2011 that is under scrutiny - and for which no written contract is said to exist. Both Platini and Blatter are believed to have told investigators the additional payment was an oral agreement for SFr 0.5m to be paid for each of the four years (January 1999 to June 2002) the Uefa president was employed by Fifa. In a statement this month, Platini said "the remuneration was agreed at the time". It is understood the men claimed an agreement to delay payment was reached at the time due to Fifa's then financial position. Under Swiss law, an employee cannot seek to have a contract paid up after five years have elapsed irrespective of whether it was written or oral. Both men have denied any wrongdoing, have appealed against their bans and believe they will be exonerated. Uefa, which meets in Nyon on Thursday to discuss the issue, has said it has "full confidence" in its president and "stands fully behind him". However, one Uefa executive committee member, Allan Hansen, has been quoted by Danish newspaper Ekstra Bladet as saying "we can no longer support him" - if no contract exists. Meanwhile, Fifa has banned Thai football chief and former executive member Worawi Makudi for 90 days for an ethics breach and indicated he could face further punishment.